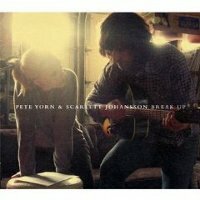 Although Pete Yorn’s last studio record Back and Forth didn’t impress me much, Break Up is a reassuringly great record that sees the artist stepping away from his rock-dominated singer-songwriter past and into 60s pop-oriented territory. His partner in crime here, actress Scarlett Johansson, adds nice touches of vocals throughout these songs and helps make the record seem more like a collaborative effort. The duo`s cover of the Chris Bell pop classic I Am The Cosmos is delightfully understated and one of the record’s best moments. Simplicity seems to be the winning ingredient throughout these nine tracks: Shampoo and Wear and Tear are both upbeat but relaxed and allows both Yorn and Johansson the opportunity to shine and show what they are capable of. I didn’t need convincing on how great of an artist Yorn can be; the fact that Johansson ends up pulling a significant amount of weight on this record was the surprising factor for me.